Unto all my treasured Leaders and readers that are sanctified in Christ Jesus called to be saint, with all that in every place call upon the name of Jesus Christ our Lord. Grace be unto you and peace from God our father, and from the Lord Jesus Christ. Please I apologize for being away for a awhile without leaving any information, am so sorry please everything happened all of a sudden but I carried you all in my spirit and never ceased to mention you in my prayers. Thank you all for your understanding. Please is my apology accepted??? Hmmm….thanks in advance! Thank you so much Pst. Gloria Okaiman, my humble Secretary Chincobee and Didi for your care and love. God bless you all in Jesus’ name. Amen. Miraim Ezeka, our women’s vice president my e-mail address is lus4love@yahoo.com. Thanks for asking. Wow! It been a while but the good news is that “you are due for Honour” for this reason, am back with the Mighty Power of our Lord Jesus Christ to subdue and expose the powers of darkness in high places. For He said, I give unto you power to tread on serpents and scorpions, and all the powers of the enemy: and nothing shall by any means hurt you. Please I want you to take a minute and laugh at your enemies that planted ensign for signs upon your life. Just have a flash back of those pressing breath-taking problems that seems as if your life will pass away, have a flash back in the life of your husband, wife, kids, in your relationships, business, career, education, and ministry, those problems that were even more pressing as you prayed and looks like there will be no way and you almost let go, almost gave up but God in His infinite mercies point His finger and work things out for you. And the Victory was yours. Beloved, can you remember any?????? Then begin to laugh at the enemies and thank God for disappointing the devices of the crafty so that their hands cannot perform their enterprise. I want you to know that when it God’s appointed time to exalt you, to honour you, He does not seek approval from any man, no qualification is require, do you know why? Because He created you, he already knows your ability, your strength and weakness. He created you for a purpose, for his glory, so regardless of what people may say to tarnish your image, it won’t work and the more the people try to consider what your enemies have slander you with, the more they will see the light of God in you because God created you in his image, for if God be for you what can be against you? Who has determined in his or her heart to slander you, to accuse you????? Hold your peace beloved because the battle is not yours but the LORD’S. They have God to answer to, for it is written touch not my anointed and do my prophet no harm. Beloved they will surely gather but for your sake they will fall in Jesus’ name. Amen. 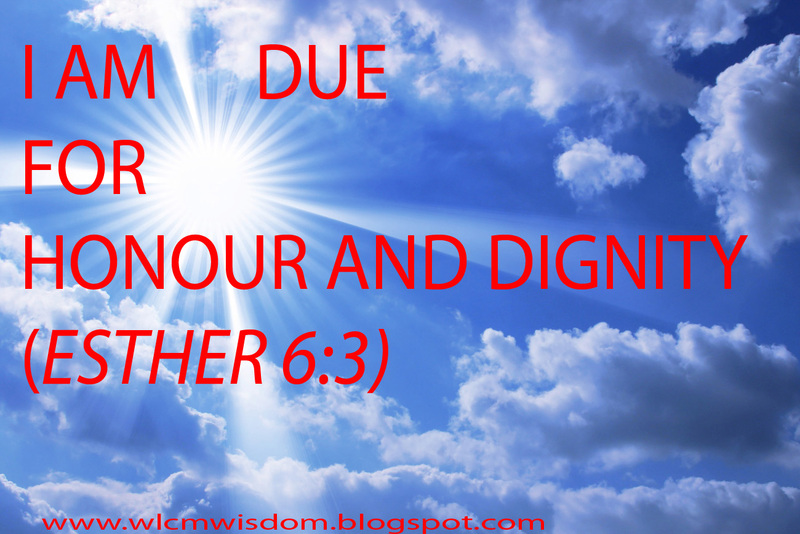 When it was God’s divine appointed time to honour a poor innocent lame man, the covenant keeping God touched the heart of King David and the he said…. And Ziba one of the king’s servant answered my lord, there is a man ‘which’ is lame on his feet, his name is mephibosheth, he lives in the house of Machir, the son of Ammiel in Lo-debar. Ziba brought in “Which”. But because it was Mephibosheth's time to be honour by God, the king pay no attention to the “Which”. By the power of the Spirit that raise up Jesus from death, I declare every “Which” the enemies have set as an ensign for signs to deprive you of your honour I erased it with the blood of Jesus, Amen. The king sent for Mephibosheth and his story changes, a lame man dine with the king, his honour has the prince was restored, a royal blood finally being where he belong. Every evil veil spread to hide you from achieving your goal I release the Holy Ghost fire upon it in Jesus’ name. You are a royalty, a chosen generation, an external excellency, a joy of many generation, in Jesus’ name, Amen. Guess what happen? 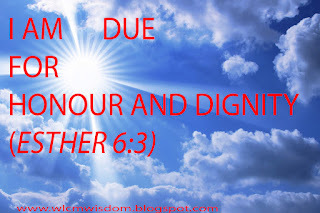 Mordecai’s accuser, his slanderer in the person of Haman walked in at that moment, and as usual, Haman thought in his demonic devilish heart “hmm…..Who else will the king delight to honour if not my humble self” so he began to list the things to be done. You see my beloved readers sometimes it is very good to have an educated and civilized enemies, one that loves good things of life, o yes! Oh! O Lord It is time for thee to work for the people have made void thy law. I declare in the name of Jesus, this month of November, your enemies will introduce you to a greater connection because the Covenant keeping God have purpose to honour you. Amen. Beloved I told you to hold your peace for the battle is not yours. Don’t be moved, just have faith in God and don’t compromise for the zeal of the Lord shall perform this. Amen. Whatever the enemies have plan against you from January till now, sickness of all types, disappointment here and there, setback, heartbroken news, you’ve spent money in test yet the doctor says there is nothing wrong with you, and you are tired and fade up. I declare healing upon your life, I declare restoration, no blood sucking demon will see your blood because you have been bought with the precious blood of Jesus. Do you know that “before an honour, comes a question?? ?” Beloved, a question will be asked concerning you and guess who will answer on your behalf “wow! No one but your enemy.” And after that divine introduction, he or she will be mourning and cover his or her face with shame! For who can curse you when God have blessed you? Just believe in God and don’t compromise your faith for the zeal of the Lord shall perform this. I cover you with the Blood of Jesus. All that concerns you I cover with the Blood of Jesus. You are sealed for greatness. Congratulations and Happy New Month!!!!! I love you all! Remain bless. Amen. Hello love, how are you doing? Good to have you around too. welcome to November a Month of "Divine Honour and Dignity." Chichi love, you are sealed for greatness in Jesus name, Amen. Awwwwh welcome back dearie i trust you are okay.. O yes my time of favour, honor and rememberanc is here.. Thanks for this message..
Thou shalt also decree a thing, and it shall be established unto thee: and the light shall shine upon thy ways. Job 22:28. Beloved, am doing Great. thanks for your love. you are highly favour. Amen. thanks a lot for stopping by! remain bless. Amen. Hi hi, it indeed is my year of honour and remembrance.. Thanks for this message. Thanks for this wonderful message dear.. Welcome back sweetheart. I got the email. You will see my message soon. Thanks for this great spiritual food. Remain blessed.